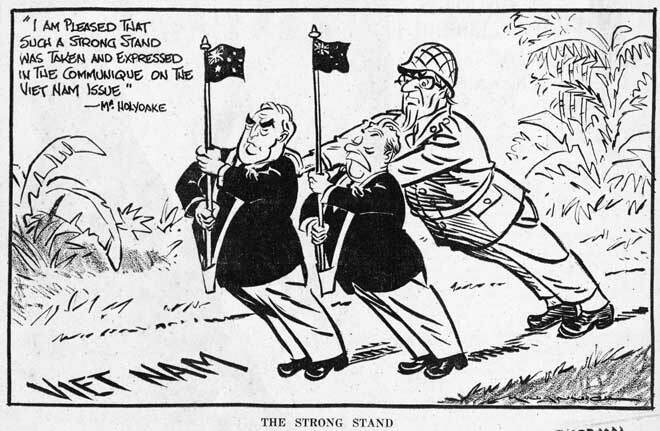 In this cartoon from April 1964, Uncle Sam pushes prime ministers Robert Menzies of Australia and Keith Holyoake of New Zealand to make stronger contributions to the Vietnam War. While officially supporting the American efforts, Holyoake was reluctant to commit New Zealand forces. New Zealand had recognised the South Vietnamese regime, but initially sent only a surgical team and later a party of non-combatant army engineers. Increased pressure from the US, along with the Australian commitment to send troops, led Holyoake to send combat troops to Vietnam in 1965. New Zealand forces initially consisted of an artillery battery. Later on infantry companies, a Special Air Service (SAS) troop, a joint services medical team and a number of air force personnel were also committed. In contrast to the Australians, Holyoake was never prepared to commit a large force, or to send conscripts to Vietnam.